HECK! I found a ton that I loved online this past week... so I had to put a post together anyway. 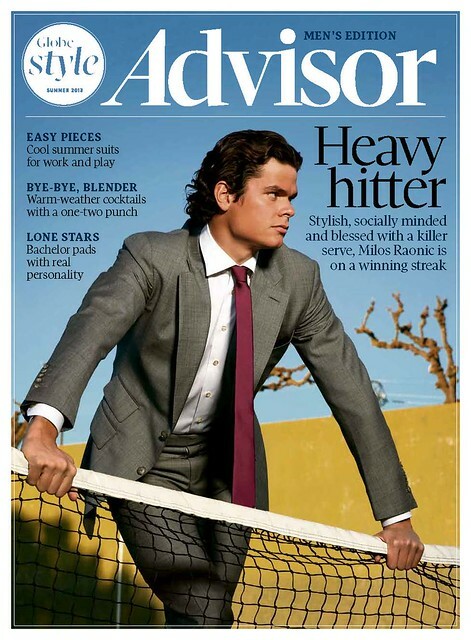 Consider it some long weekend browsing material! Enjoy! 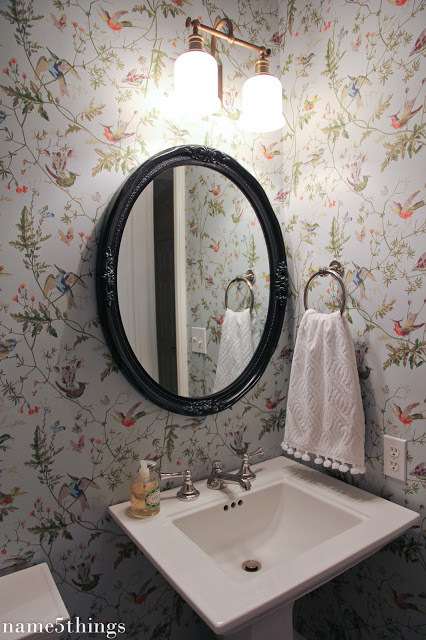 I am so in love with Emily's powder room! 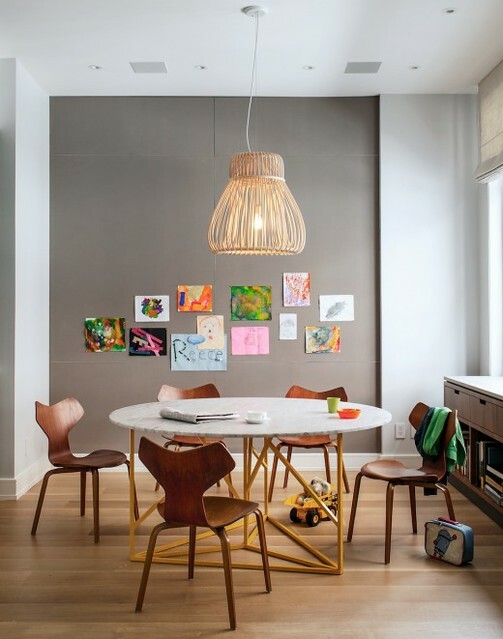 The wall paper, the light fixture, the mirror, the artwork - it's all perfection! Makes me wish we had a powder room here that we could pretty up like this. Maybe we can do something really fun in my laundry room? 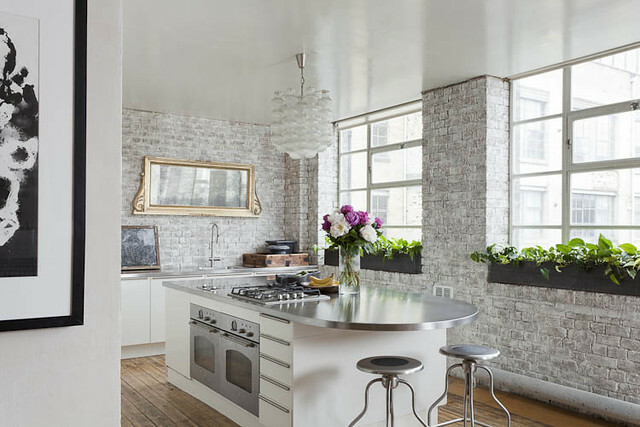 Love this bright, white kitchen, featured on desire to inspire this week. 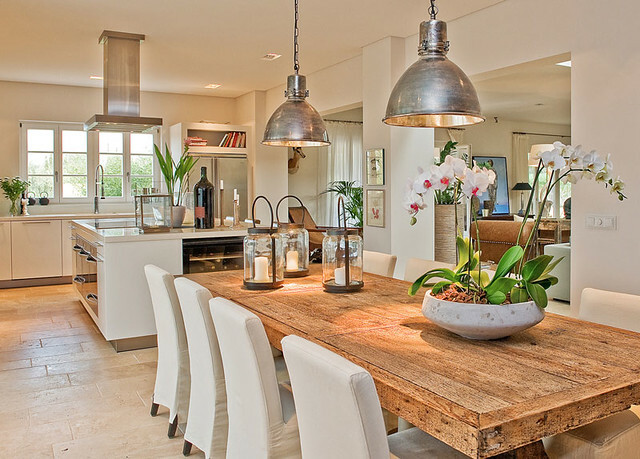 So fresh looking - but I love the addition of texture through that gorgeous dining table. 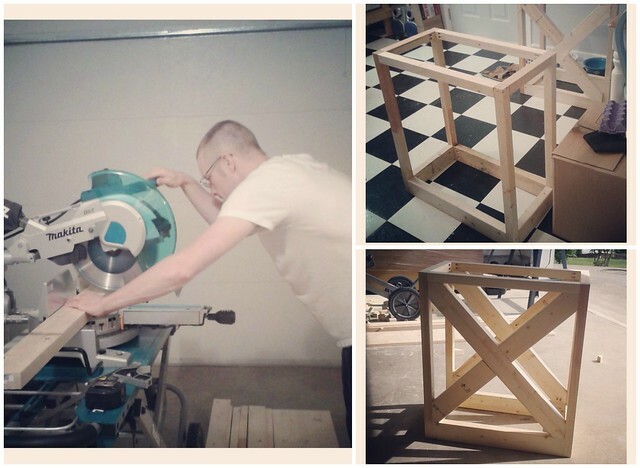 Let me just say, when my desk is complete, building a dining table is next on our list. We'd both like a nice big harvest table where we can seat lots of family and friends! 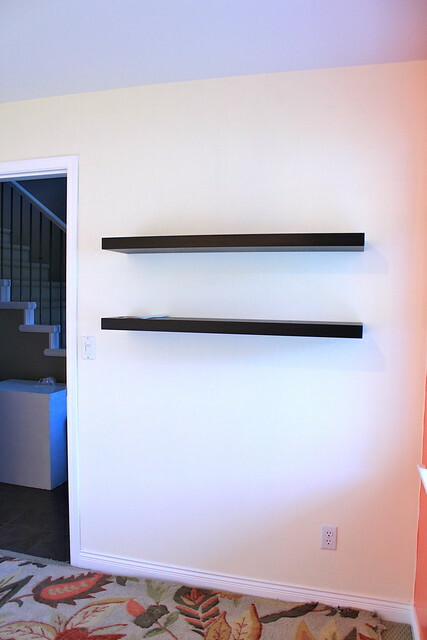 Shannon gave us another look at the shelves my Father built for her living room. They are all full now, and she's added some great artwork. They look so great! 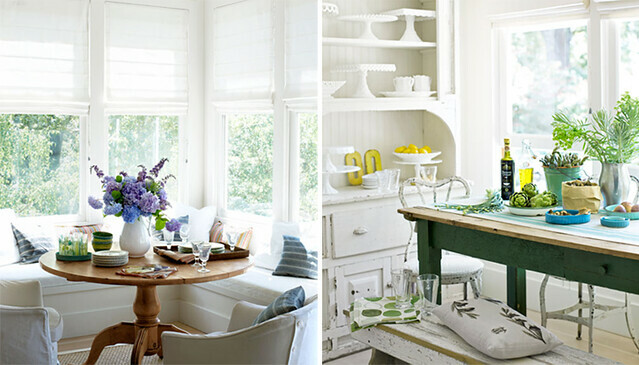 A pretty farmhouse in California, featured on 79 ideas. 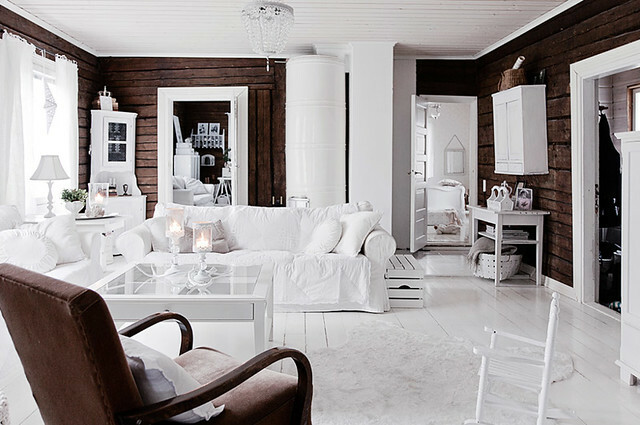 A clean palette with lots of pretty objects (but not too much), is my dream. We have a long way to go in our new place before my dream is truly realized of course! So excited for the long weekend. Lots of fun to be had with B and Halle (I hear the rain is supposed to clear for us! ), and of course hoping to make some progress on my office and a few other little projects around the house. Someone has a birthday party in a few weeks and we need to get this house into a more organized state of chaos than it currently resides in. What do you have planned for this weekend? Normally Friday's are saved for Fancy Friday love... but I just couldn't post one after not posting all week. I also meant to share my office progress with you all week, but my camera cable was missing and I wasn't able to upload new photos. I managed to find another compatible cable last night, just in time to give you a first glimpse into my new "Mom Cave/Office Space"! Don't mind that too large area rug on the floor. It's the rug from our living room at our old house, and I thought it would be perfect in here. Turns out it's too large, so we have plans to have it cut and bound again (works out well since Harley chewed up one of the corners of it anyway). It's been vacuumed and shampoo'd once... and I may do it again after we get it back from being cut down. 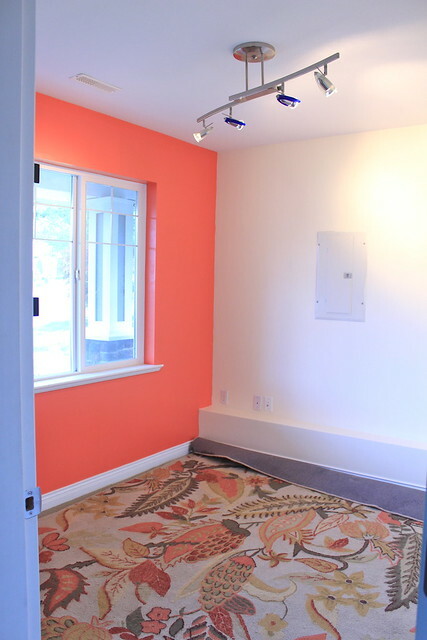 I love that it will fill the entire room though - talk about instant and inexpensive flooring change! I also made a little switch up on the closet doors. 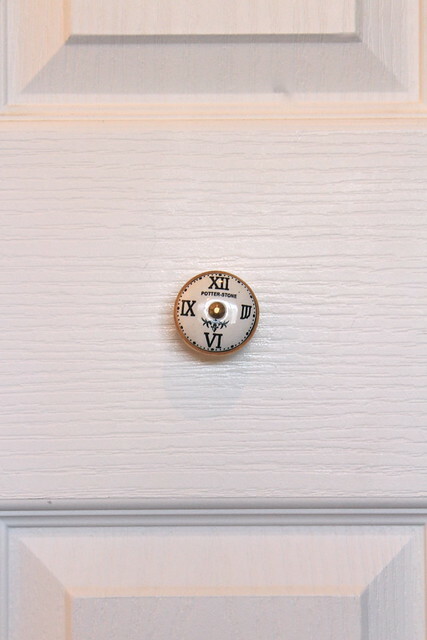 I took off the old pulls on there, and added these clock pulls that I had sitting around the house. Such a small, but fun little detail. Aside from getting that rug taken care of, I also plan on doing a little DIY lighting switch - hope it's something I can tackle before the end of next week to share with you. I'm really excited about this project... and to lose that awful light fixture that is currently in the room. The wall with the electrical panel, I also hope to turn into a display type wall for all of my Halle Handmade tags. B and I seem to have two different ideas, so we'll need to sit down and put our heads together to figure out the best way to tackle that project. Window coverings also need to go back up. The vertical blinds that came with the house need to be cleaned and put back up, and then I plan on adding the light weight IKEA curtains that we had hanging in our kitchen at the rental. Lots to do still - thankfully it's a long weekend! B has also been working on a building a desk for me! It's a great option because it's custom so I will get the look and size I want for the fraction of what it would cost us to buy something! For a desk that will be close to 10 feet long, it will cost only just over $100 - not bad, right? It's looking great so far, and if you follow me on Instagram you've probably caught a few peeks of how it's coming along. I can't wait to share more with you next week! Speaking of next week - Google Reader is officially done as of Monday! SO, if you are looking for a new way to follow along, I'm on Bloglovin! You can find a link in my right hand side bar (right under my blog roll). I'd be happy to have you follow me there! You can also find me on Facebook - I have an RSS feed that shares my posts, and every so often I share other bits and bobs there too! So Happy Canada Day weekend to all of you fellow Canadians! What are your plans this weekend? We're still living in a mostly empty house (not much furniture on our main floor), and I want to take my time to decide on the right pieces to fill it. Obviously we plan on staying for a while and I want things to be just right. We have two niches on the main floor, in the dining room & in the kitchen. 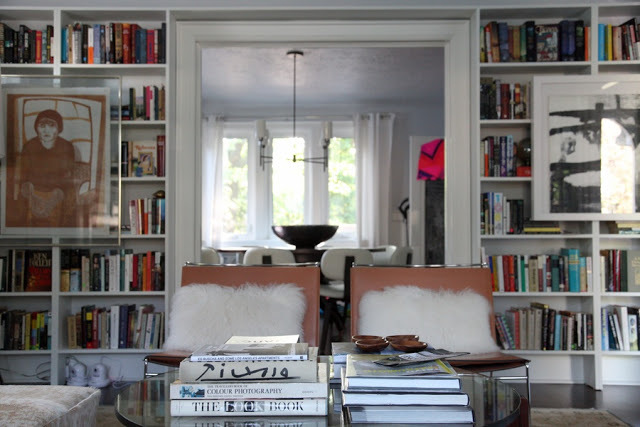 After seeing this post on House of Turquoise on Tuesday, I'm positive that this is how I want to fill the niche in the dining room - perfect shelves and cupboards, with some great lighting! 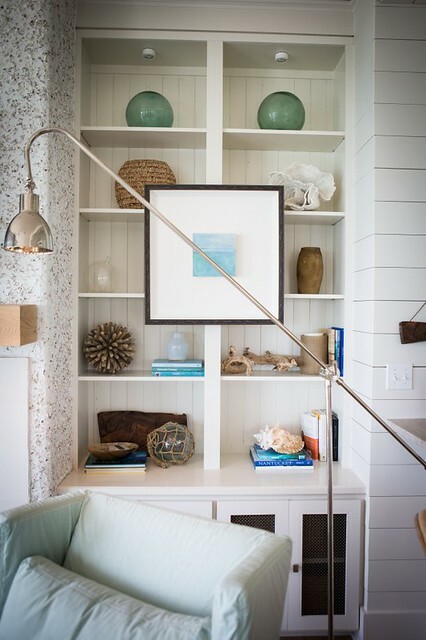 I love this charming Beach House that was featured on Daily Dream Decor this past week! 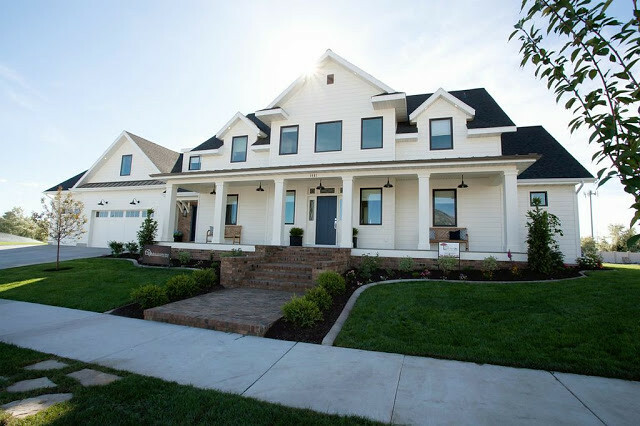 Did you catch the gorgeous home that Caitlin Creer did for the Utah County Parade of Homes? She'll be sharing more pictures soon, but I just can't get over the gorgeous exterior. Stunning, don't you agree? I'm looking forward to this weekend! We have a birthday party on Saturday for one of Halle's friends, and Sunday we're hoping to attend a Children's Festival. I really love getting out and doing family things on the weekend. I also have big plans on completing the paint in my office, so I can share it with you next week! It's coming along nicely! 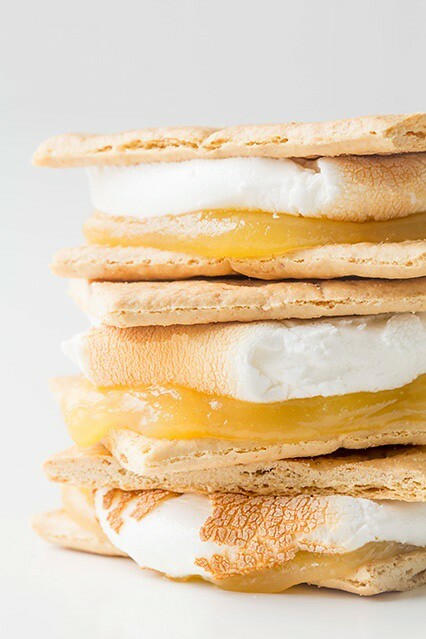 What do you have planned for this first weekend of Summer? Since things are a little slow moving on the home front, I've decided to start a new series around here. It's called "Breaking Down the Board". How often, when you follow someone on Pinterest, do you actually take the time to search through all of their boards? I don't know about you, but most of my Pins come from my main feed of people I follow or the "Everything" filter that I so often search. It's very rare that I actually go to a particular person that I follow to filter through their boards to find things that inspire me. That's what "Breaking Down the Board" will be all about - me going through some of my boards to share with you some of my favourite pins, whether it's recipes I've tried and loved, or rooms that inspire me for different reasons, I want to share with you what I've been pinning and loving. 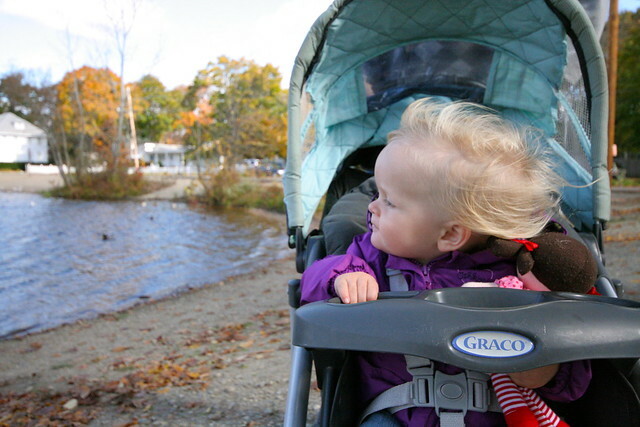 Just the other week, Halle and I went to a friend's place for lunch and a play date. My friend had whipped up some pasta for the girls and a delicious tofu quinoa salad for us. It was the perfect healthy lunch, and filled us up nicely. I knew it was something I'd love to add into the rotation for us at home, especially since we try to incorporate some meat free options into our meal plans. So, last week I pulled up this recipe on Pinterest, and made this salad for dinner - only the tofu wasn't smoked, and I used a large tomato diced instead of cherry tomatoes and red pepper instead of yellow pepper. It was a winner for sure! I even whipped some up without the tofu on Monday as a side to dinner, and it was delicious! 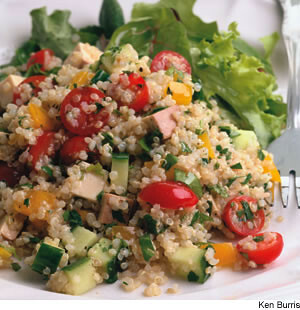 If you're looking for something instead of pasta or potato salad this summer, I say go for this one! I wasn't too sure how this would taste, and unfortunately my first attempt at making it didn't turn out the best. I learned quickly that you REALLY need to let it boil for quite a long time. 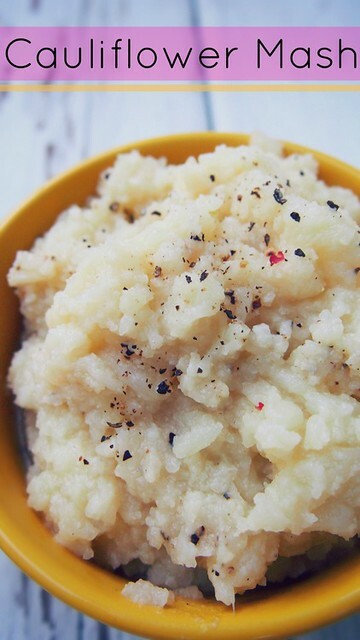 Once I got it right though, it was obvious that Cauliflower Mash is a pretty great sub for those empty carb heavy regular mashed potatoes. I love making this to go alongside chicken or pork chops these days, and I'm even thinking they would be a great addition to a holiday meal! 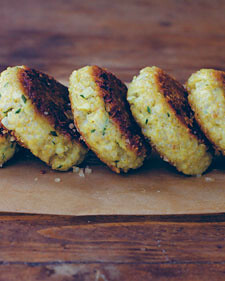 This is the recipe that got me hooked on Weelicious (I've since bought the cookbook and totally recommend it). These nuggets take some time to make but are so worth it, especially since you can freeze some for later meals. 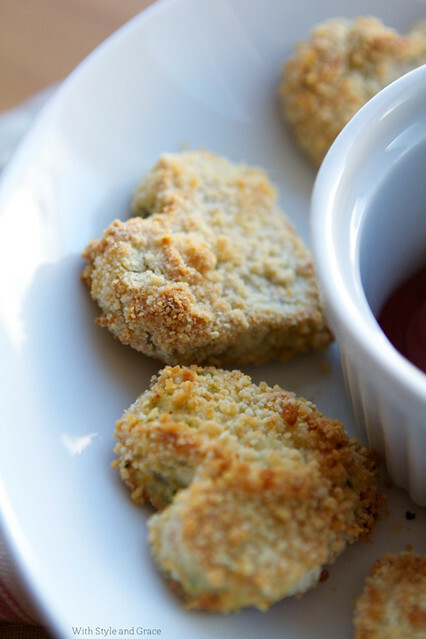 It's such a fun way to incorporate veggies into your kids meals, and I honestly think these would be the best thing ever for expecting Mom's to whip up and freeze if they have little one's running around - no worry meals for when the new baby arrives! OH... and B and I love them too - it's a huge win! 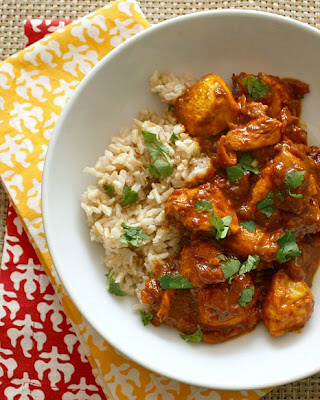 For B's birthday in February he asked if I could make him Butter Chicken for dinner. I wanted to oblige but was feeling worried about all those fatty ingredients in it, so I started searching for a healthier way to make it. This recipe turned out to be the perfect compromise and the birthday boy was really pleased with his special meal. The secret to it? Low fat plain yogurt! When I spotted this pin, I knew we'd have to give it a try for the summer (I love burgers, but with cardiovascular disease running in my family, I try to refrain from red meat as much as possible). 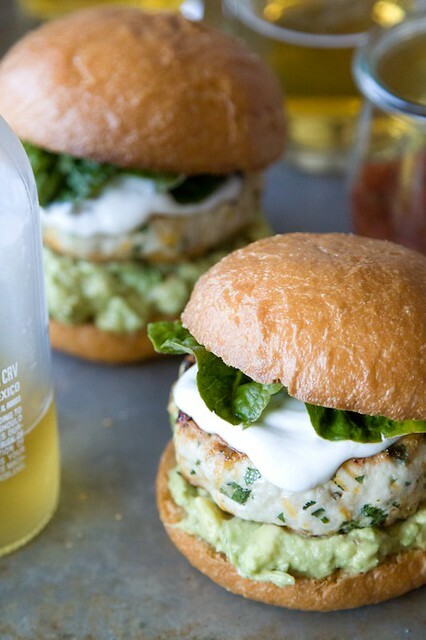 To make this we visited our local farm market and picked up everything we needed, and then when we made the burgers we just left the jalapeño out of Halle's burger! 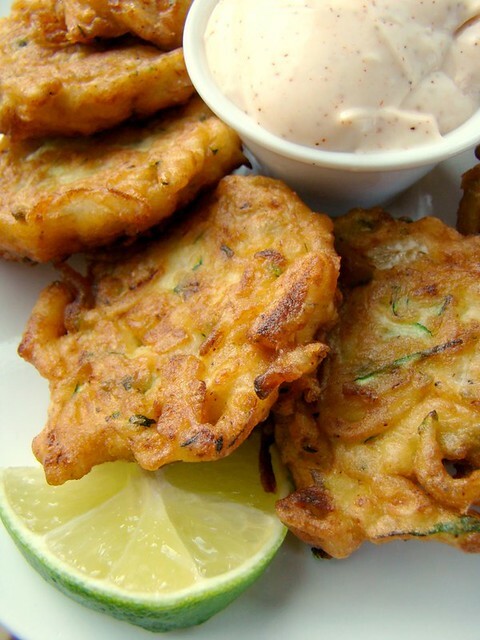 What a delicious Friday night meal in the summer! I actually first discovered this recipe back in the winter in Edible Vancouver (a publication I pick up at local farm and organic markets). They taste delicious, but I had a really difficult time getting them to the right consistency to stick together well for cooking. Also, I cut the recipe in half and it still made way too many for just us (Halle isn't really up for enjoying quinoa yet - no matter how I cook it). I think next time I'll make a 1/4 of the recipe! Saved the least healthy for last! We usually stay away from fried foods (again... cardiovascular disease), but these were worth the treat. They were pretty easy to make, but you need to make sure the oil is at the right heat, or else the outsides will overcook and the inside will still be gooey! Even Halle had a few bites of them dipped into the mayo (we went light on the chilli powder in it. This one obviously won't make it into our regular rotation, but I'm sure we'll enjoy them again... one day! As I mentioned the other week, Halle's birthday is really creeping up on us quickly. I'm in the process of planning and purchasing items, and at the top of my list is invites. Mailing out invites is one of my favourite things to do. Everyone loves receiving mail, and I find a mailed invite feels more personal and thoughtful. 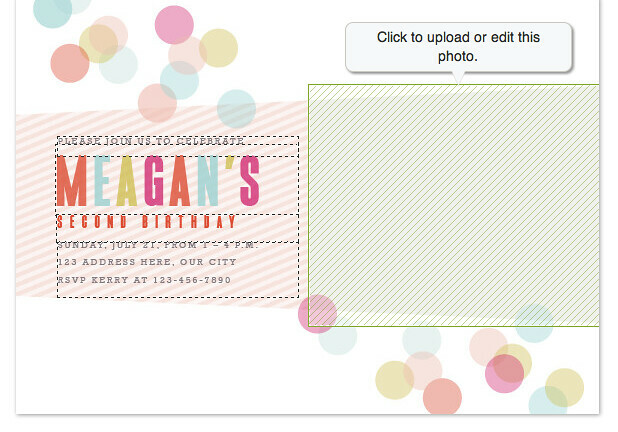 Of course, not everyone has time to DIY up some gorgeous invites for a party and this year, that is definitely me. Luckily, I was able to work with Minted to create some really gorgeous invites for our girl's second birthday, quick and conveniently. It was seriously hard to pick just ONE design, but in the end I just couldn't resist the confection children's birthday party invite. With my back selected I had a chance to look over all of my final decisions on one page. It's here that you are able to make any additional changes to your invite's, by making a request on the page that will go directly to the designer. I like this feature, since it really let's you personalize your products more than any other website! 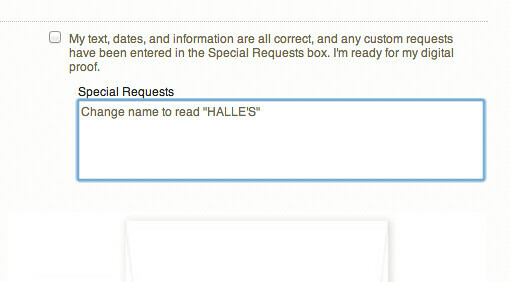 In the case of Halle's invite's I kept it simple and, of course, only requested to have the name changed to our sweet girl's. It took about a day for a proof to come back to me for my approval, and once I virtually signed off on everything they went to print and were shipped off. I honestly loved the whole process of selecting and personalizing these invites and I can't wait to send them out to our family and friends! What I REALLY love about Minted is that they work with indie designers from all over the world, giving them a chance to make their beautiful work available and grow their careers. 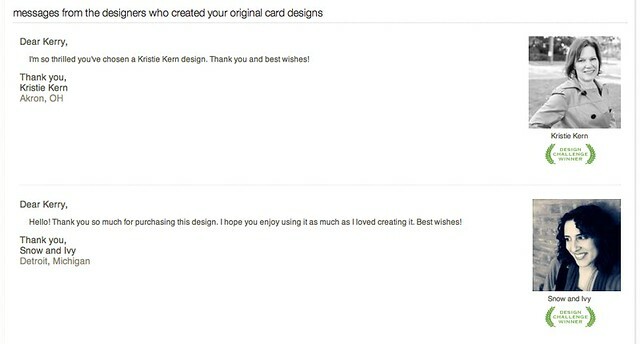 It feels pretty great to receive a little personal message from them after you place your order. So, Halle's invites are ready to go out, so I will wait to share the final design until I know they have all been received. 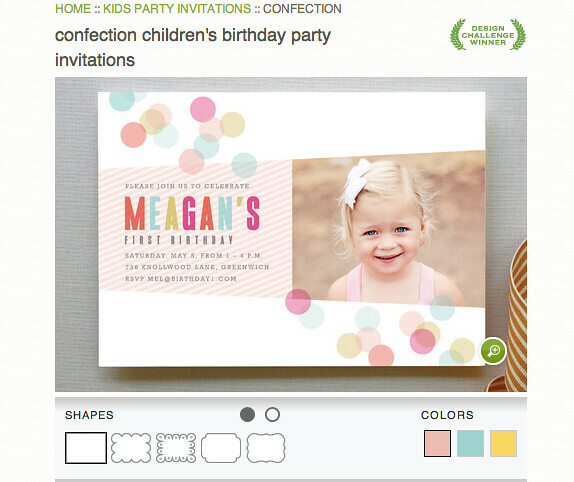 Have you worked with Minted before? 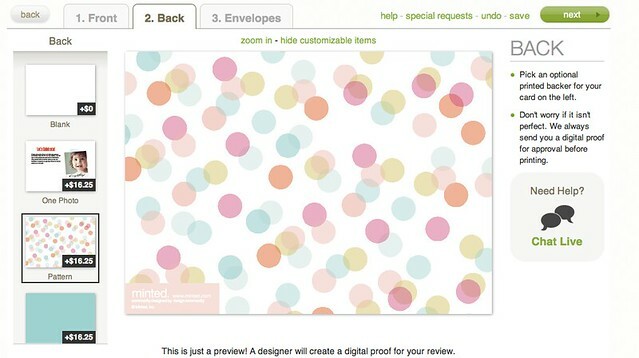 How did you enjoy the whole process, and have you done anything more to personalize an order from them? I'd love to hear what you think? 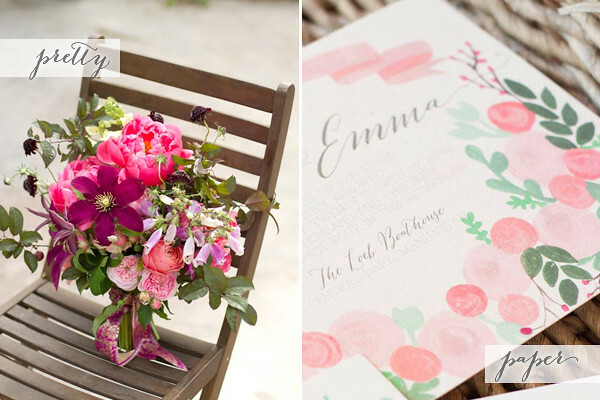 *I was provided my invites and a birthday bunting in exchange for writing about Minted. All opinions expressed in this post are entirely my own. When we moved into our new home, it all seemed really big and light and airy. 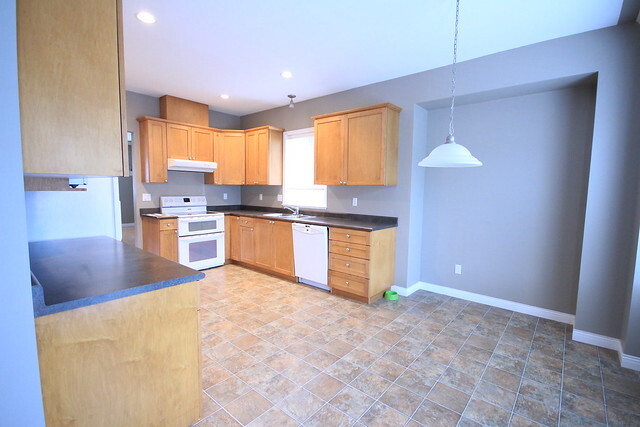 For the most part, we liked what we saw, but we knew that we would want to make some changes to this place to make it feel like our own and one of the first places we planned to start in, was the kitchen. It's not BAD, just not really our style... so it had to go. Lucky for us, we found a solution before we even got the keys. 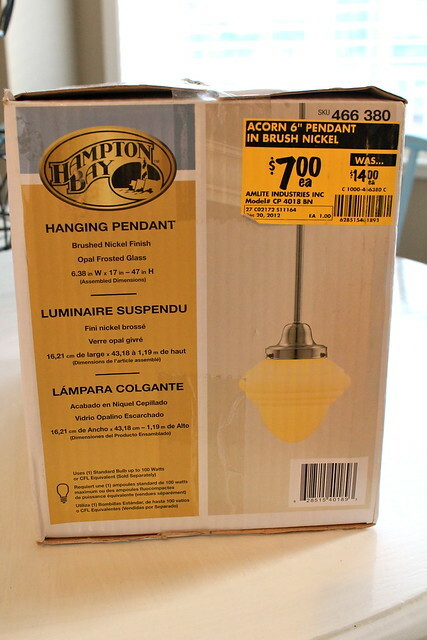 During a regular trip to Home Depot we came across a great light ON clearance for $7.00... and there was no way I was leaving it behind. 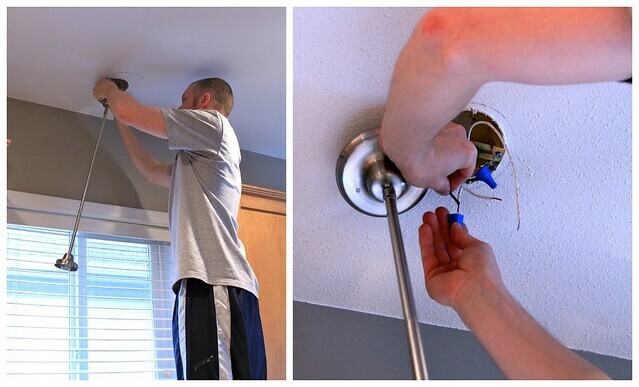 So after turning off the electrical, B removed the old light fixture and began the process of getting the new light up. 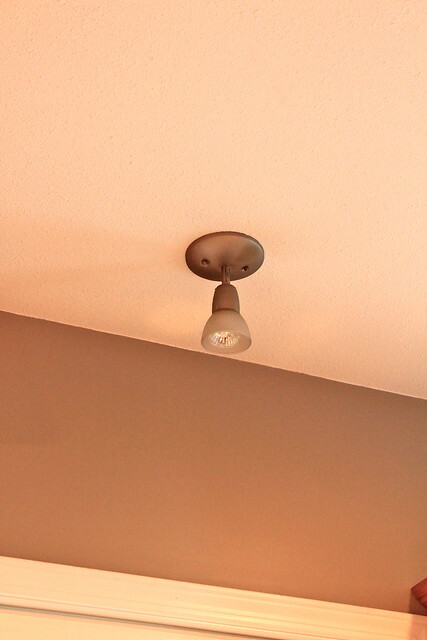 I thought about sharing a tutorial, but there are so many better tutorials for changing out a light fixture online... so I'll just stick to the update. We opted to just use two of the down rods to get the perfect height. I didn't want it too long (of course), but I didn't want it to be too short and look as awkward as the original light fixture we were replacing. We both love how it looks, and it's really just the first small step in making this place feel more like us and only for $7 and less than half an hour of our time! I plan on putting the original light fixture up on Craigslist as well, so hopefully it will bring down the cost of this little project even more. 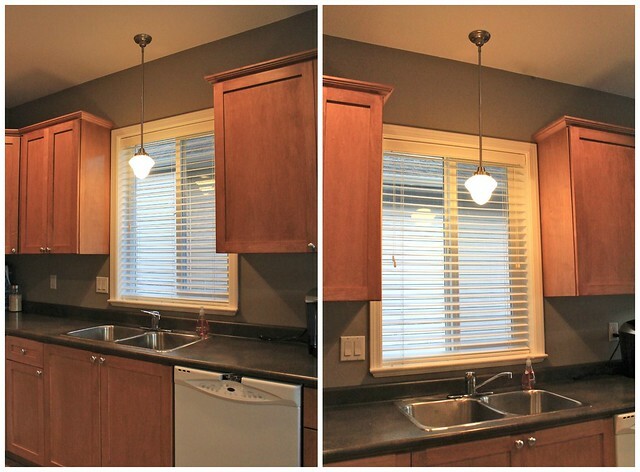 Have you been making any small upgrades around the house recently? Anything inexpensive and small, but makes a huge difference to you? Love this pretty floral, feminine entry on Daily Dream Decor. It just seems so light, clean and inviting. 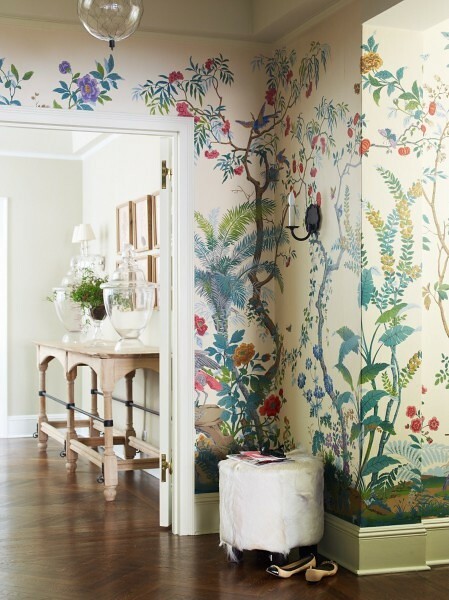 The floral wallpaper is beautiful, but so is the console table in the back of the photo. I don't know if I could convince B to wallpaper the front hallway of our new place like this though. The gorgeous photography of Krista Keltanen was shared on desire to inspire this week. I was digging this room. The contrast of the dark walls with all of the light furnishings and accessories is absolute perfection! We're not using real flowers for the bouquets at the wedding. It's one of the areas where I decided to save, and I'm pretty excited about what I have planned. However, there are moments when I see gorgeous bouquets, like this one from Oh So Beautiful Paper, and part of me wishes we were doing real flowers. Well, the weekend is here and I'm so looking forward to B being home from work. There will be some more unpacking (of the less important stuff that is still in boxes), and I hope to finish painting my office and make some progress on setting up Halle's room so that we can get her in there. I can't wait to share more of our house soon... I'm so itching to make this place feel like ours! What do you have planned for this lovely June weekend? 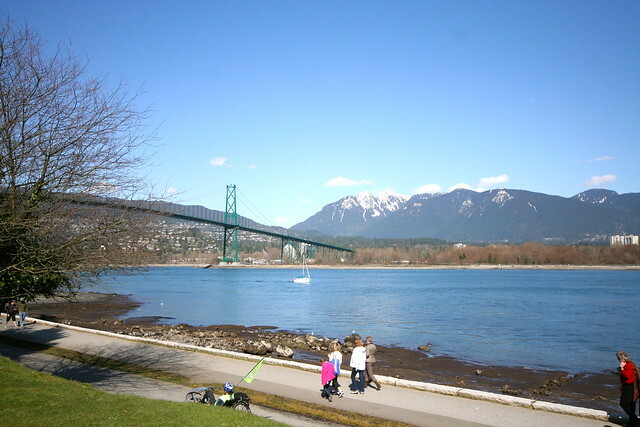 The other week when I answered your questions about our new home, my friend Katrina mentioned that she would love to read a little more on how I like living on the West Coast vs. the East Coast (okay, yes Toronto is not the East Coast, but when you are living in B.C. it feels pretty far East, so just humour me!). I thought that this would be a great topic to address, and to help explore my own feelings on how I feel about these two places that I consider "home". I'll start off by saying that somehow I still manage to call both my hometown of Whitby and our new place in British Columbia, "Home". I guess home is wherever your heart is, and even though B, Halle and the pups are all here on the West Coast with me, many of our family and friends are living on the East side of Canada and the United States. With that being said, I could never pick a favourite between these two coasts, so this is just a list of some pro's and con's for each place. When we first moved out here everyone talked about how it rained ALL of the time. Yes, it does rain A LOT, and I thought that the weather would really bother me, but to be honest, it doesn't. I love when it rains at night, and on the days that it does rain , it rarely ever rains for the entire day, so Halle and I are still able to get outside for a walk and some fresh air. 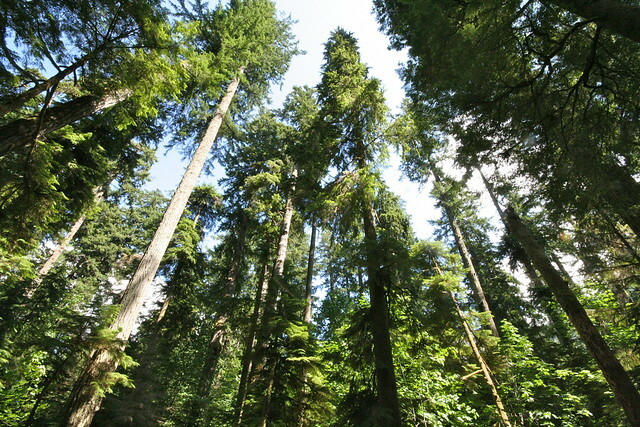 Overall, the milder temperatures of the West Coast are something we love much more. I don't miss the long, dark frigid winters we had in Toronto, full of slush and snow. I'm much more content with mild, wet winters, that involve a relatively short drive to a mountain to enjoy the snow! Plus, on the sunny days in the summer the weather is perfect. You don't get the excessively hot and humid days like you do back East, which is fantastic. Overall, I think I'm much more suited for this "Wet Coast" weather. One thing we have definitely struggled with, is the cost of living. It is much higher out here, from gas and groceries to the price of houses. It's part of the reason that we moved further east from Vancouver than we already were. For example, Gas is about $0.10/L cheaper in our new area than it was even in the last place we lived... which is still probably about $0.10 - $0.20 more expensive than it is in the GTA. Craziness I tell you. At the same time, though it may be more expensive, to us the outdoor lifestyle and quality of life we have out here is much more enjoyable, so we are finding ways to make it work! In this area though, the Toronto area definitely wins for cost of living! I'm sure it's quite obvious that we both miss our family and friends in both Toronto and Boston. Despite meeting some really great people out here, it's been quite an adjustment for both of us being so far away from everyone we love so much. 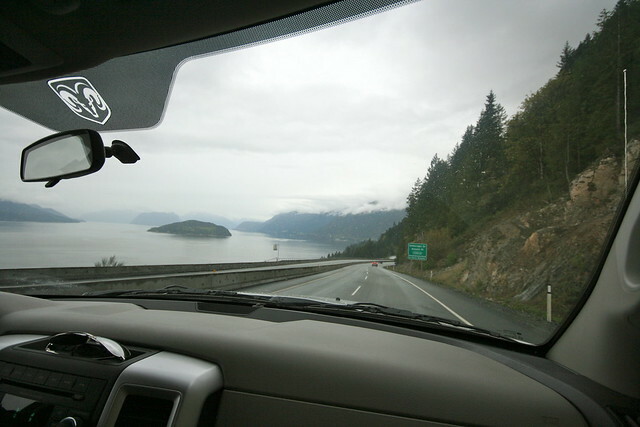 Up to this point, we have been lucky to make trips back fairly regularly, as well as have family and friends out to visit, which has made it a lot easier, but we know it won't always continue at this rate. At some point, something will have to give and we won't be able to afford as many trips back, and we won't have everyone rushing out here to visit us all the time either. So while we have made some really great friends and memories, Toronto and Boston will always hold our hearts. Overall, we really love our lives on the West Coast and most days I am convinced I was meant to live out here. Of course, I miss my family and oldest friends so much, but I think this whole experience has brought our family closer. I once read that living in a new place with the person you love can help to keep your relationship fresh and exciting, as you see the person in a new environment and new situations and challenges. I totally understand that, and if you look at a situation like ours as an opportunity, it really can draw people closer together. We've worked together as a team to make sure all three of us are happy out here and to find the right balance and lifestyle that works for us. 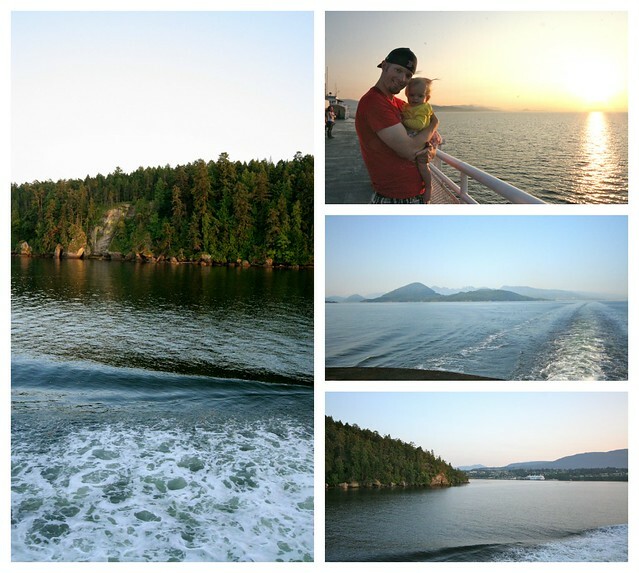 Will B.C be our forever home, or will we move back East at some point? It's hard to say today, I mean, a year and a half ago we never would've imagined we'd even be living here at all. Things change and different opportunities arise, but for our family, right now, I feel like we have found our little slice of heaven. I feel like we have really found a place that we can make a great home for us, right now. B had started the painting process while Halle and I were back in Toronto. 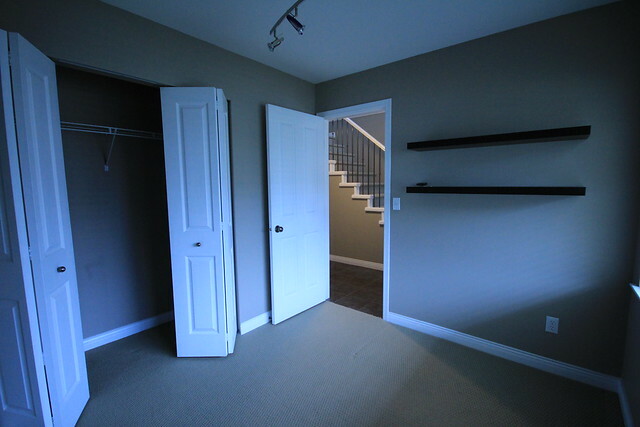 We picked out the paint colour and bought the paint from Home Depot before we even took possession. I wanted to keep the walls neutral (as I usually do), but didn't want to go with a stark white. Our final colour choice was Behr's Polished Pearl, and B was the one who pulled it to show me. 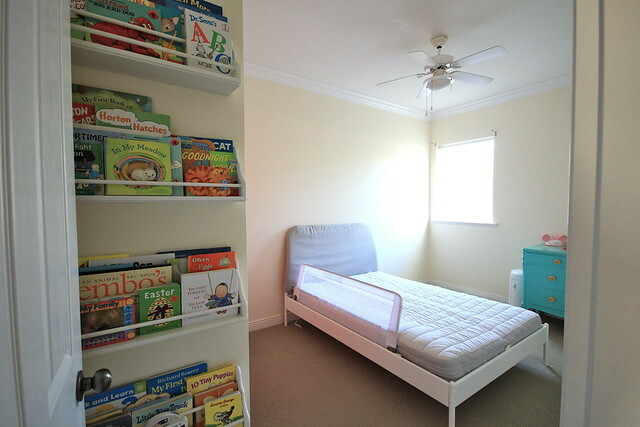 It's still neutral, but it's a nice warm colour and it works nicely with the coral and teal we are using as accent colours, as well as the hints of yellow that will live in her room. The first couple of coats that B put on were Behr's Ultra Paint and Primer in one. 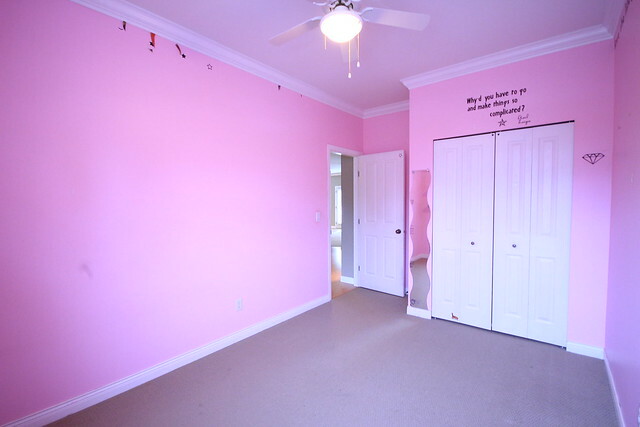 It worked great to cover that bright pink, and saved us time and money. We did a third coat in Behr Premium Plus Eggshell finish, just to get a consistent look on the walls. The room is all painted now and what a difference it makes. It looks so fresh (the walls were very dirty) and warm, and I think it actually looks bigger now. (The photo below was taken from a slightly different angle... and obviously after we started to move stuff in... we still have a long way to go). The walls weren't the only thing we painted though. 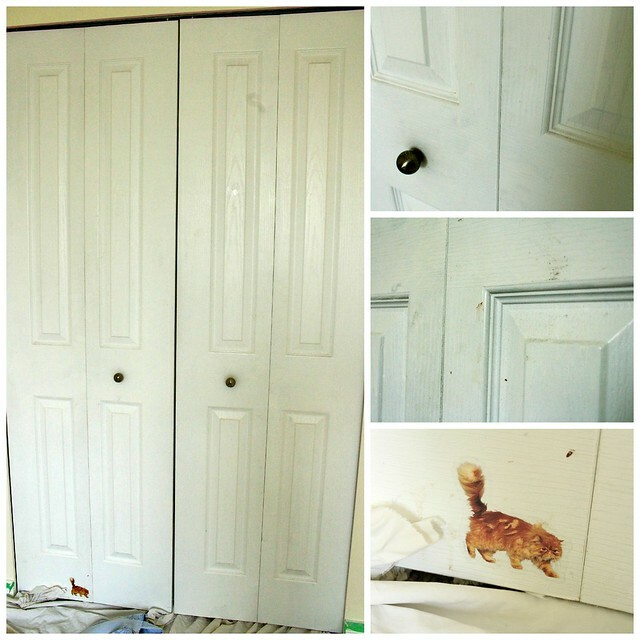 When we arrived last Monday and I went to check out the room I noticed that the closet doors were really grimy looking and would need to be painted again. 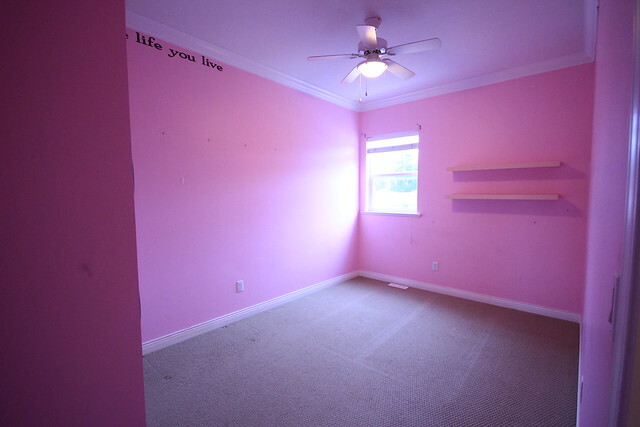 I only considered using white for a split second, then I thought to myself that this will be a little girls room and I wanted it to be really fun for her. 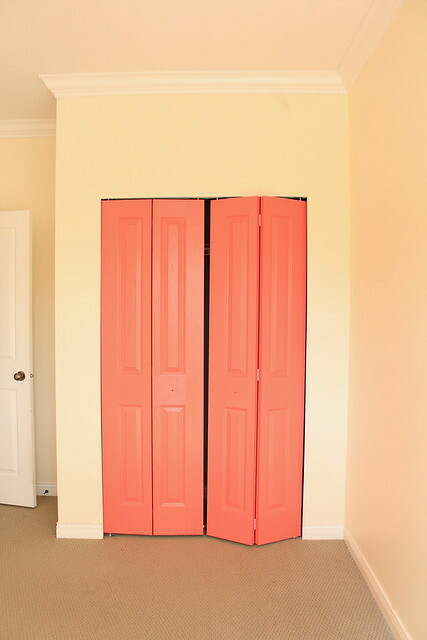 I suggested to B that we buy a quart of coral and use it for the closet doors. 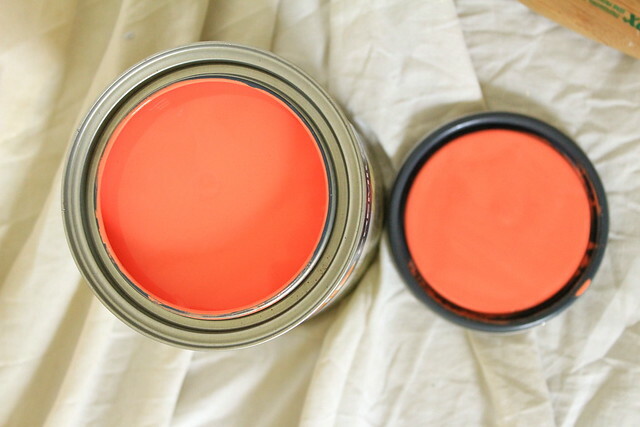 Our colour choice was CIL Oriental Coral, and I love how it looks on her doors. 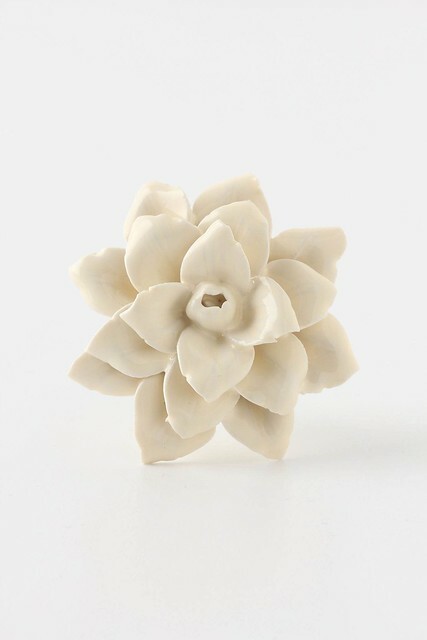 I'd love to order these knobs, from Anthropologie for the closet doors. They are on sale for $2.95 a piece (AWESOME!)... but they want to charge me $20 to ship them to Canada (NOT so awesome). So our search continues for the perfect knobs. I feel so happy when I walk into her room now. It's such a sunny, happy space and there's more happy to come. We have a shade that's been following us around for about 3 years now that I would like to swap the ceiling fan out for, and the previous owners left some floating shelves that we plan to paint and hang again. So lot's more to do in this space, but we hope to do most of it with things we already have! 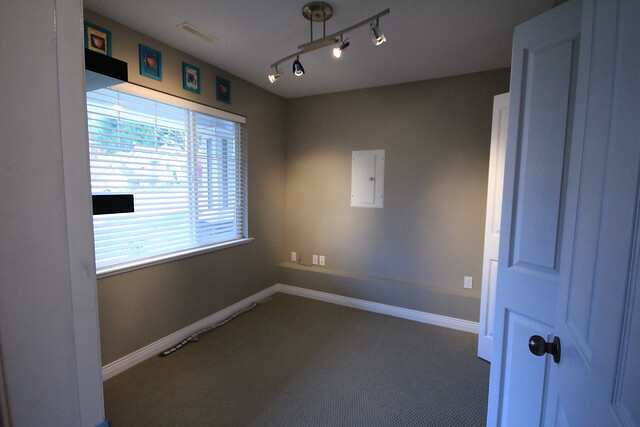 What room's have you been refreshing with paint recently? 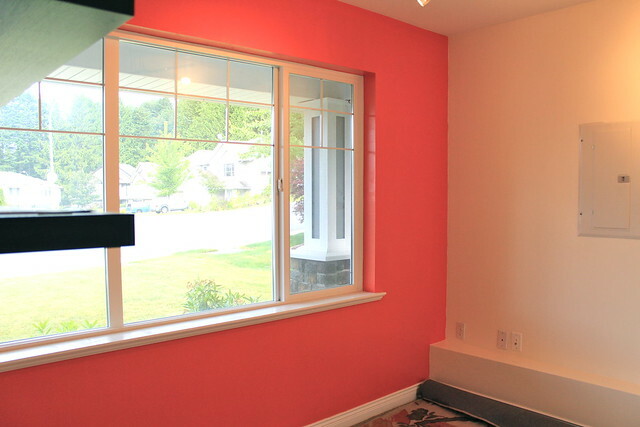 Do you agree that there's nothing like a fresh coat of paint to transform a space?